Switching lamps on and off is something we do, without giving it much thought to the processes involved. DrDAQ can be used to highlight the processes at work. 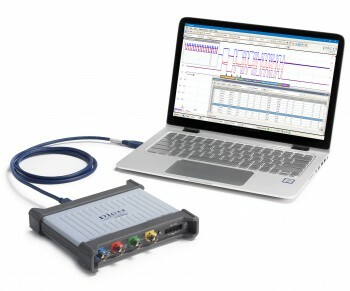 DrDAQ data logger in conjunction with the PicoScope oscilloscope software. A 6 volt lamp and fixed resistor. A resistor was connected in series with a 6 V filament lamp. A DrDAQ was then used to measure the voltage across the resistor. The DrDAQ was placed facing the lamp to detect the light strength. The original purpose of measuring the p.d. was to identify the moment at which switching occured. However it became clear that that if p.d. was measured across a known resistor, placed in series with the lamp, the data obtained could be used to find the changing resistance of the lamp. DrDAQ was set up to measure both voltage and light intensity using the PicoScope software. The settings used are easily seen in the screen shot below. As can be identified from the display, the blue line [channel A] is the p.d. across the resistor and the red line [channel B] the light intensity. Is this response time of about 150 ms likely to cause problems, or to be of benefit, in most lighting circuits? Why is the start of the curve almost horizontal? What is being emitted by the lamp filament before it is hot enough to emit light?